Are you a first time student? You can now start here! Through a regular weekly practice, prenatal yoga can help reduce stress, ease the common aches and pains of pregnancy and develop useful pain management and breathing techniques for labor and delivery. To help you find your path into a regular practice, we have developed several options for class packages and series. Pre-registration is not required for yoga classes! Come and join us for class! Water, mats and props are provided free of charge. We do not pre-register our UWS Prenatal Yoga Classes. Simply stop by the studio and join us! All Prenatal yoga packages have an expiration period, please note the expiration date when you purchase your package. 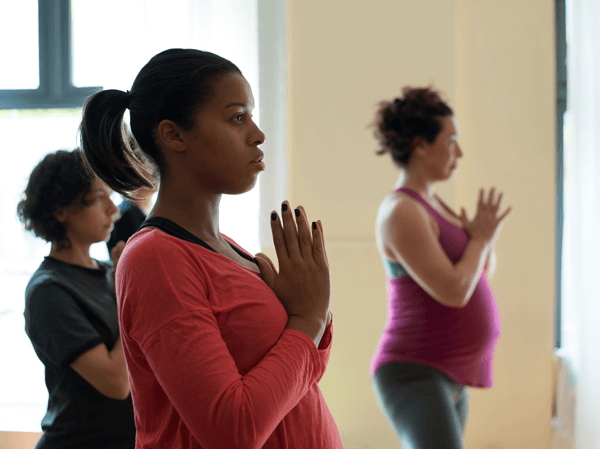 Package holding students can attend any of our Prenatal yoga classes at our UWS location. Please note the expiration date of your class package (70 days for an 8 class package and 31 days for our PYC pass and One Month Unlimited). If you give birth during your class package, all unused classes will carry over to Postnatal Yoga and/or Baby & Me Yoga Class. You will have 6 months from your baby’s birthday to finish your classes. Valid for 70 consecutive days. If you give birth during this time your remaining classes roll over to Postnatal Yoga or Baby & Me classes. Two week extensions can be purchased through the studio for $10. If you were unable to practice due to medical concerns please email the studio a Dr’s note. With 2-month minimum contract. Valid for duration of contract. Students can enroll at any time. Available for in-studio purchase only. PSSSSTTT- Package purchasers receive a FREE GIFT! 3 prenatal yoga videos and 3 pregnancy related articles! Keep an eye out in your email for your FREE GIFT! Postnatal and Baby and Me Yoga classes have a 6-month validity period.